Deputy Prime Minister Nick Clegg has promised rail passengers in northern England more seats, more services and new trains under franchise plans announced by the Government. PLANS to give rail passengers in the North of England more seats, more services and a new fleet of modern trains were unveiled today. 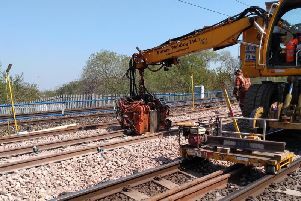 They were published by Deputy Prime Minister Nick Clegg and Transport Secretary Patrick McLoughlin as part of a package setting out the expectations for bidders for the new Northern and TransPennine franchises. These old trains have been rattling across rails in the North for over 30 years; a constant source of complaint which have held the region back. The publication of the Invitations to Tender is the first step in the transformation of train travel between the northern cities. It is also a significant step in the creation of a northern powerhouse for the UK economy. Mr Clegg said: “This is an historic moment for the North. Improving rail links in the region has been much anticipated. “These old trains have been rattling across rails in the North for over 30 years; a constant source of complaint which have held the region back. “As part of my Northern Futures initiative I asked the people of the North what they wanted to build a stronger economy, and transport was top of the list. “So I fought hard to replace pacer trains as soon as possible. “Today’s plans include a new fleet of trains and improved services that will better connect our great Northern towns and cities. Mr McLoughlin added: “This is great news for passengers across the north, who will finally get a rail service that matches up to the booming economy in this region. “That means more seats, more services and a brand new fleet of modern trains. “Unlike the last Northern franchise in 2004, which included limited plans to invest in services or meet demand, this deal will maintain investment and grow to fit the needs of passengers for years to come. The TransPeninne Express franchise provides longer distance intercity-type services, connecting the cities of Newcastle, Leeds, Sheffield, Manchester, Hull, Liverpool, Edinburgh and Glasgow, as well as Manchester Airport. • introducing free Wi-Fi on all TransPennine Express trains by 2020 at the latest. In August, the government announced which companies had been shortlisted in the competition to run the two franchises. For the Northern franchise, they are Abellio Northern Ltd, Arriva Rail North Limited and Govia Northern Limited. Those shortlisted for the TransPennine Express franchise are First Trans Pennine Express Limited, Keolis Go-Ahead Limited and Stagecoach Trans Pennine Express Trains Limited.